In the beginning, I was always more scared, than calm, excited and confident like those around me. holding the surfboard, admiring the view, and staring to find a way out, and watching board (type, and) traffic. while little surfers who rode waves before they could walk, whizzed past me on what looked like skateboard-sized little slivers of foam. I remembered feeling trickles of ocean meandering through my sinuses, and wondered how nobody had mentioned that would happen. Somehow it all still felt like home. It's funny, the thing that made me keep going back, and eventually build a life around being able to play in the sea as a way of life. I never stopped to think about it, until one day, after a few weeks of flatwater, the water bump gods delivered. and slight panic -- I hope it's not too crowded! "I am leaving this coast!" Pretty tiny wheel shells (Zethalia zelandica) on Pakiri Beach, New Zealand. My Surf Love Story. Bibelot Bay Journal. The Mermaid Tribe. Candace Loy. 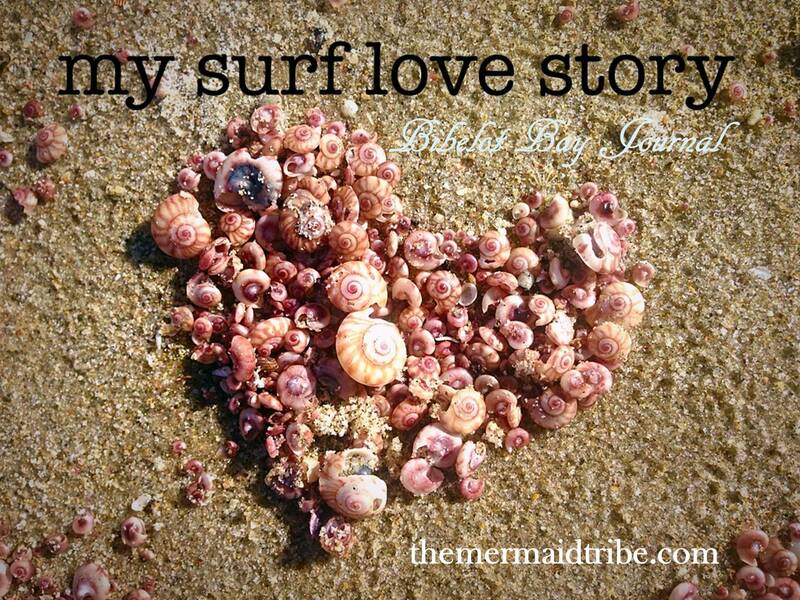 Since when did saltwater swishing around in your sinuses become part of a soppy surf story? Always. Mushier than peas. Ding Diaries: For the Love of Board. This story is dedicated to a childhood friend, Adele. It is her birthday. You would have been an effortless goddess on a wave.